google_protectAndRun("ads_core.google_render_ad", google_handleError, google_render_ad);WordPress requires a valid user name and password credentials in order to access administration Dashboard, where every settings and configurations, including posting blog post entries in the WordPress-powered blog taking place. If you’re sole administrator for the WordPress blog, losing or forgotten the password to the WordPress Dashboard is kind of hell, as the blog can be considered lost other than continue publishing existing contents. 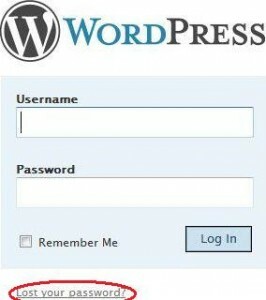 Luckily WordPress has some built-in mechanisms that allow blogger, user or administrator reset or recover the password. Note: Actually WordPress doesn’t allow user to recover or retrieve back the existing password. Any password recovery method will reset the password to a new password which can then be used to login to Dashboard. The most easy method to reset and recover password for WordPress user is to use Lost your password? link at the WordPress wp-login.php login page. Upon clicking on “Lost your password?” link, WordPress will display a “Lost Password” page which allows user to enter username or e-mail address. Enter either one, and then click on Get Net Password button, and you will receive a new password via e-mail. The default password recovery method for WordPress works if user defines a valid and working email address in the user profile. If for some reason the e-mail account is no longer accessible, and hence user won’t be able to read the email with new password, it’s possible to reset the password for the WordPress user in the database wp-users table. Note that this trick only works on WordPress 2.0 or newer version, and requires user to manage the MySQL database which stores and saves the data for the blog which password been forgotten or lost with phpMyAdmin. Login to phpMyAdmin connected to the MySQL database server. Select the database the used by the WordPress blog that the password wanted to be reset. Locate the wp_users table (normally the last row), and then click on the Browse icon under Action column on the same line. Locate the user_login which the password want to be recovered and reset, and then click on the Edit button in front of the line. Under the user_pass field, delete everything in the corresponding Value field on the same line. Enter a new desired password (case sensitive) in the now empty Value text box, i.e. NEW PASSWORD in the illustration. Select MD5 in the Function field drop-down menu. Click on Go button to save and reset the password. After resetting the password, use the new password to log in to WordPress.